Strut to your Shabbat party in style with this felt black fedora hat! The Shabbat Abba has never looked so snazzy! 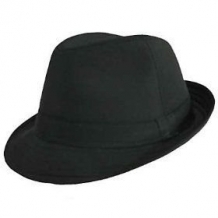 The Child Size Black Fedora Hat is approximately 20'' in circ.. 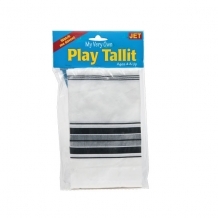 Play Tallit, 28" x 36" Looks and feels like the real thing! (Corners are rounded so that real tzitzis are not required) .. This ingenious design allows for Children to experience the Tefillin experience with an easy to use just like Abba Tefillin set! Made from durable plastic with soft 'like leather' straps..
A King, A Queen, A Princess, A Prince! 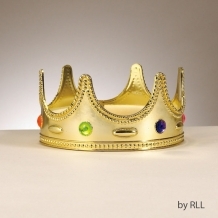 You can be royalty with this fun gold-jeweled Purim crown! 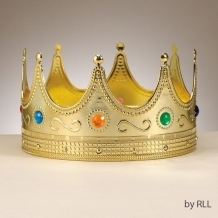 ..
You can be Purim royalty with this brightly colored jeweled, gold tone, Purim crown! Measures 8" in diameter. 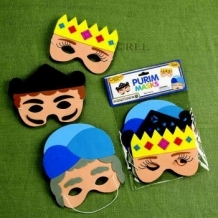 ..
Slip on a quick Purim disguise with these colorful foam Purim masks! Includes 1 Queen Esther mask, 1 Mordechai mask, and 1 Haman mask! ..